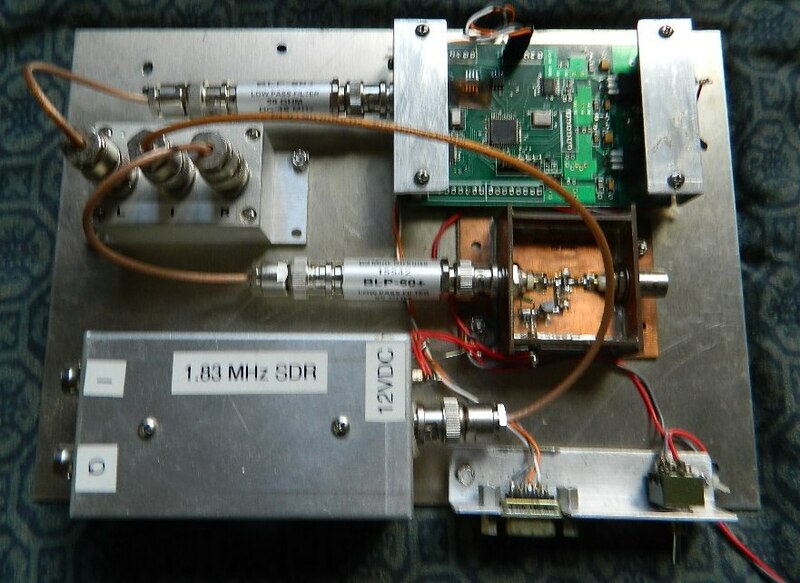 A couple of months ago, I built this hybrid SDR using a single band SoftRock Lite II kit that was built for 1.83 MHz, as an IF with a frequency converter built from a ring mixer, a DDS frequency synthesizer, a good wide band preamplifier, and some low pass filters. The end result was a single conversion receiver that performs rather nicely from 50 KHz through 50 MHz. To control the radio, I used the built-in RS-232 interface of the DDS board with a command line program written in C, called by a modified version of Quisk. Alternatively, one can simply use a dumb terminal program to control the frequency of the radio. If the radio is built as shown, using the listed components, it can be expected to work well. For those who wish to have a little more information and might want to depart from this design, some of the technical rationale behind this radio is explained in brief. The reader is advised, that if one does something different, then different results can be expected. There is no strict definition of a "hybrid" software defined radio. In this case, it is a combination of a current technology analog radio techniques, used with a direct conversion software defined radio to create a single conversion "hybrid" radio that is usable over a wide range of frequencies at a much lower cost. In essence, the radio shown here is a 160 meter band SDR with a tunable wide range frequency converter to gain coverage on other bands. To build this, you need the following items, or reasonable substitutes.. This is a rather remarkable 3 KHz through 100 MHz diode ring mixer which is well suited for use at VLF through low VHF frequencies. It has a connectorized enclosure with BNC fittings, with all the ports rated for a 50 ohm impedance. It is a level 7 mixer, which means it works really well if the local oscillator injection level is about 0.5 V p-p. As of this writing the price of this mixer is about $50 (it is well worth it). You can order it from Minicircuits directly. The radio requires a good, spectrally clean frequency synthesizer capable of operating from 1.8 MHz through 54 MHz with approximately 0.5V p-p output into 50 ohms. It should be controllable via RS-232 or USB if you want to use it with Quisk. I used a DDS board which I make, and sell. At about $260, it is not cheap, but is a reliable performer with low phase noise, a wide operating frequency range and rather good accuracy. This board requires an external low pass filter for proper operation. You can find more information on it HERE. For the radio shown here, the DDS board firmware was customized to fit the need and likely needs to be adjusted per-radio if accuracy to the nearest Hz is desired. Alternatively, you can use an RF signal generator, or an arbitrary function generator, but may need more aggressive filtering, and might experience more problems with phase noise, accuracy, and frequency stability issues. The SoftRock Lite II is available as a kit, or as an assembled unit. It is an exceptional value for the $21 price of the kit. It is a single-band fixed-frequency I/Q receiver that you can build for various bands. You can order the SoftRock Lite II kit HERE. In this radio, we are building a single conversion radio, so the SoftRock Lite II is built for the 1.8 MHz band so that it can be used as the IF. This radio requires a preamplifier having a combination of three properties that can be hard to arrive at in a single preamplifier. First of all, the preamplifier needs to provide wide bandwidth (50 KHz-50 MHz, in this case). Secondly, it must have a sufficiently low noise figure as to be usable as a front-end amplifier at VHF frequencies. Lastly, it needs to provide a useful amount of gain in order to overcome the 5 dB conversion loss of the mixer, and to provide some additional gain for the normally modestly deaf SoftRock SDR. Insanely high amounts of gain are not a good idea, as it will not improve sensitivity measurably, and will compress the already-modest dynamic range of the SDR even further. If the preamp gain is very high (greater than 20 dB), a 50 ohm, 10 dB attenuator placed at the mixer's RF input port, between the preamp output and the mixer's RF input port will reduce compression of the dynamic range without degrading the sensitivity of the receiver, and will have the added benefit of guaranteeing a good impedance match for all frequencies at the mixer's RF input port (which helps assure good mixer performance). For VHF work, the performance of the radio is going to be limited by the noise figure of the front-end. Unfortunately most wide bandwidth mmic amplifiers have unacceptably poor noise figures in the neighborhood of 4-5 dB. There are a few exceptions, one being the Minicircuits MAR-6 mmic. It offers a noise figure that is typically better than 2 dB, which is just barely good enough for use at VHF frequencies. In the radio shown here, I used a preamplifier of my own design which was published in QEX several years ago, and offers rather good performance. A minor modification to the preamplifier was made, with the input and output coupling capacitors changed from 0.1 uF to 0.47 uF, to push the low end -6 dB frequency response of the preamplifier below 50 KHz. A partial kit of the preamplifier with boards for the preamp and enclosure is available from Far Circuits for about $17. Go to their web site and use your web browsers "Find" feature to search their page for "AA8C", to find information on the boards. The total cost of building this preamplifier is about $25. Click HERE for a link to my web page where you can find the parts list, instructions for building it, and download the transparency images of the boards so that you can make your own boards if you wish. In any receiver, it is a very good idea to suppress unwanted frequencies wherever possible. Doing so minimizes opportunity for intermodulation distortion and overload from strong out of band signals, and thus improves receiver performance. Because the desired high-end frequency coverage was at the 6 meter band, a 50 MHz low pass filter was installed after the wide band preamplifier. It is a good idea to not install anything that causes a signal loss ahead of the preamplifier, so as to not spoil the noise figure of the radio. A 50 MHz BLP-50 low pass filter from Minicircuits was used. This filter typically exhibits 1 dB attenuation at 52 MHz and is appropriate for the job. The filter has a 50 ohm impedance and has BNC fittings. It sells for about $40. If you build your own filters, a low Q three-element T-type low pass filter is adequate, and easy to build. The DDS synthesizer has no on-board filter, so an external filter is required to suppress the mirror frequency and to keep the output as clean as possible. It is a very good idea to keep the cutoff frequency of the low pass filter as low as possible in order to maximize attenuation of any potential unwanted products from any synthesizer. In this case coverage to 52 MHz was desired so a 50 MHz BLP-50 low pass filter from Minicircuits was used. This filter typically exhibits 1 dB attenuation at 52 MHz so it was deemed good enough for the job. The filter has a 50 ohm impedance and has BNC fittings. It sells for about $40. If you build your own filters a five element PI network filter, or better, is advised here. The MAR-6 RF preamplifier used in the front-end produces gain well past 2 GHz. Since most of this bandwidth is not useful for this radio, some means of limiting the bandwidth is a really good idea. Common solutions for this include band pass filters, using a preselector, or using a magnetic loop antenna. The radio shown here is used with magnetic loop antennas for HF, and for the 6 meter band, with very good results. The magnetic loop antenna is a highly desirable solution as it can easily provide excellent band-specific selectivity ahead of the preamplifier without unduly degrading the receiver noise figure due to added loss. Wide bandwidth antennas may prove to be problematic in a crowded strong signal environment, while persons operating this radio in the countryside far from a crowded signal environment might find a wide bandwidth antenna to be acceptable. You will need a computer with a sound card in order to use software to use the I/Q output of the SoftRock Lite II. If you use the DDS synthesizer shown here, you will need an RS-232 interface (115.2K, 8 bits, no parity, 1 stop bit) to set the frequency. You will need software to use the SoftRock Lite II with a sound card. I built a small PC with a mini-itx board having a AMD A6 GPU, and a solid state drive and 8 GB ram. I installed Fedora 19 Linux and managed to get the on-board sound device working. This little computer is dedicated to SDR and digital modes exclusively and is not used as a workstation. A modified version of Quisk 3.6.18 was compiled and installed from source code. The current, unmodified version of Quisk is available HERE. 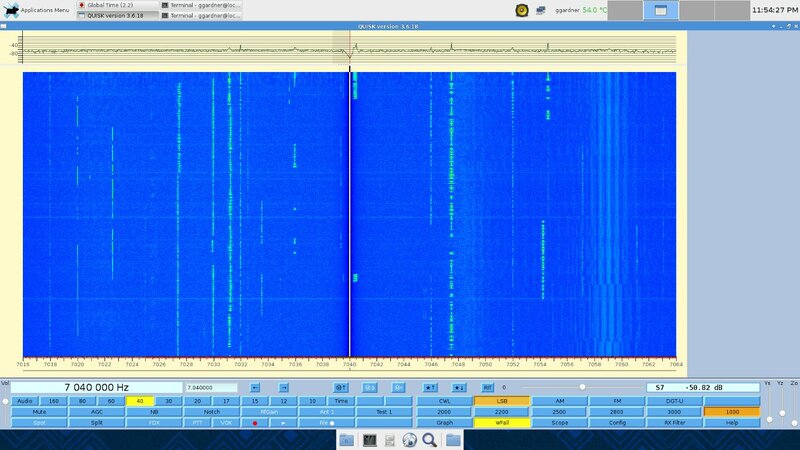 Click HERE to see a screen shot of Quisk used with this radio on 40 meters. FLDIGI was also installed and has been confirmed to work with Quisk. The complete distribution of the modified version of Quisk built for X86_64 on Fedora 19 Linux, is available HERE. Changes include a different color map for the waterfall, improved operation with FLDIGI, and support for Gen-5 DDS board using RS-232 on /dev/ttyS1. If you wish to change the serial port device you will need to edit quisk.py and recompile. This is an unauthorized version of Quisk and no support for it is offered. Be sure to backup your existing Quisk installation and configuration before installing using this software. In order to allow Quisk to easily control the DDS synthesizer, I modified the Quisk source code to call a command line program which sets the frequency of the DDS whenever Quisk changes frequency. The source code for the command line program is available HERE. The command line program can also be used in a stand-alone fashion without Quisk from a command prompt, or from a shell script. Alternatively a dumb terminal program can be used to set the frequency of the DDS synthesizer via RS-232. GTKterm is known to be compatible with the DDS board and supports direct frequency entry. *Incoming RF signals at the input of the MAR-6 preamplifier are amplified by about 20 decibels. *The output is fed to a 50 MHz low pass filter in order to improve unwanted frequency rejection. *The amplified and filtered RF is delivered to the ZAD-6 mixer where it is mixed with the local oscillator output from the frequency synthesizer, which is adjusted to the sum of the IF center frequency (@ 1.8 MHz) and the desired operating frequency. *The output of the mixer consists of the sum and difference frequencies of both the local oscillator and the incoming RF frequencies. When built for 1.8 MHz operation, the SoftRock Lite II has a tuned input which will pass the 1.8 MHz IF frequency output of the mixer and reject the sum of the incoming RF and local oscillator frequencies. *For the radio to work correctly, the frequency of the synthesizer must be set to the sum of the desired operating frequency and the center frequency of the SoftRock Lite II. For example; If the center frequency of the SoftRock is 1.854321 MHz (these vary a bit, so yours will be a little different), and the desired operating frequency is 14.040 MHz, the synthesizer must be set to 14.040+1.854321=15.894321 MHz. *The SoftRock functions as an I/Q modulator and converts the 1.8 MHz IF to I/Q outputs for use with a PC sound card.